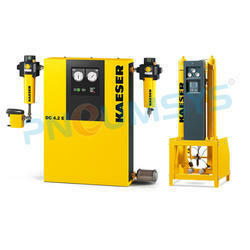 KAESERCompressed Air Dryer is Reliable and efficient for all drying levels. Kaeser Compressed Air RefrigerationDryer System has Compact energy-saving refrigeration dryer with impressive latent heat storage. SECOTEC industrial quality refrigeration dryers (TE and TF (*) series shown here) have long been valued for their stable pressure dew point performance. The thermal mass chamber of the innovative SECOPACK LS heat exchanger system is filled with a phase change material. Its significantly higher thermal storage density means that 98 % less storage material is required to achieve the same capacity as conventional storage media. 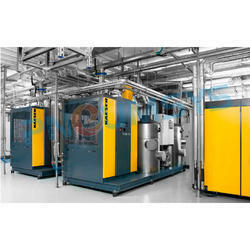 Storage capacity for pressure dew point stability therefore goes hand in hand with hugely reduced space requirements. Optimized flow paths minimize pressure losses and consequently help enhance SECOTEC dryer efficiency.